Since 2009 the Department of Residence Life along with the Residence Hall Association, Utilities & Energy Services, Transportation Services and the Office of Sustainability, has facilitated a competition between residence hall communities around energy. Additionally, Siemens has been the sponsor of Challenge rewards every year. The goals, as put forward by Residence Hall Association leaders who started this revolution, are: to promote individual sustainability awareness among students; to encourage sustainability habits, particularly among new students; and to build a sense of community within halls via spirit of challenge/competition. 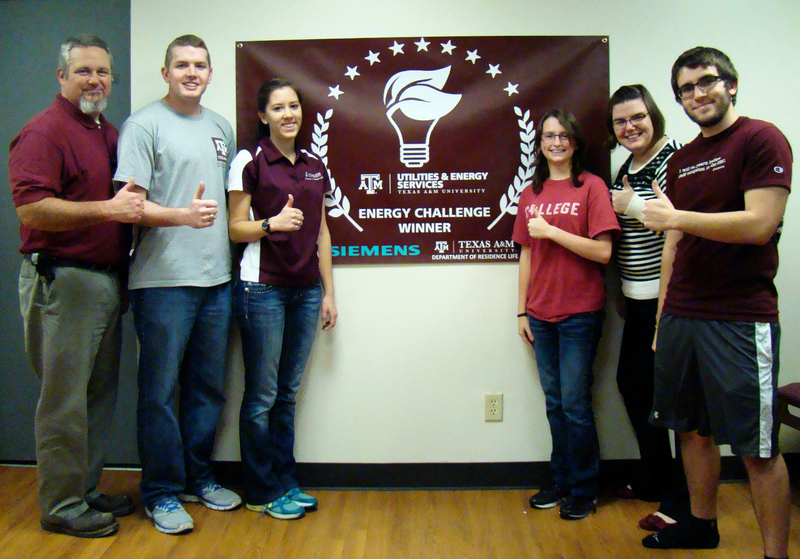 2014 marked the 7th Annual Residence Hall Sustainability Challenge. It began on National Campus Sustainability, Wednesday, October 22, 2014 and will go through November 14th, ending with Texas Recycles Day. Throughout the fall semester, On Campus Aggies have opportunities to learn about sustainability, engage in conservation activities and do service to promote sustainable practices. The week of November 3rd through 7th specifically is the utilities conservation or energy challenge. Utilities conservation for students living on campus involves practices like: shorter showers, only full loads of laundry, reduced use of electric dryers, turning lights and appliances off when not in use, changing to energy efficient lamps, and where thermostat controls setting them back while you are away. Most students have some sustainable practices already and so it is a matter of increasing awareness and options for them to expand their contributions. Challenge rewards have included: shower timers, 2GB thumb drives, pizza parties, and water bottle filling stations. 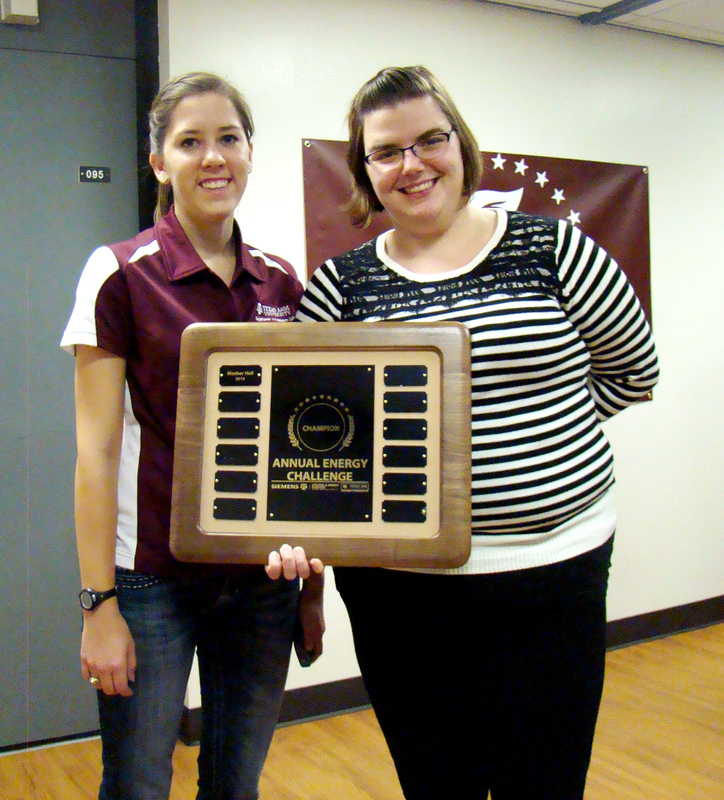 Different halls have achieved recognition for their efforts each year. Underwood was the first to receive water-bottle filling stations on each floor from Johnson Controls Inc. Some of the activities have provided participants with t-shirts or other individual recognition, as well as counting toward overall hall standing in the competition. Mosher Hall is the winner of the UES 2014 Energy Challenge, after reducing it’s consumption by 2,736 units compared to last year! Thanks to Siemens Engineering Company, UES was able to reward Mosher Hall with a pizza party, as well as awarding them with the inaugural UES Energy Challenge Plaque, which will be passed from dorm to dorm as the challenge continues through the years.